For other uses, see Jamb (disambiguation). 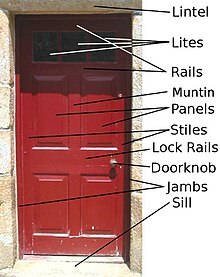 A diagram of a door, with the jambs labeled. A jamb (from French jambe, "leg"), in architecture, is the side-post or lining of a doorway or other aperture. The jambs of a window outside the frame are called “reveals.” Small shafts to doors and windows with caps and bases are known as “jamb-shafts”; when in the inside arris of the jamb of a window they are sometimes called "scoinsons." The word jamb is also used to describe a wing of a building, perhaps just in Scottish architecture. John Adam added a 'jamb' to the old Leith Customs house in the Citadel of Leith in 1754-55. ^ Nikolas Davies, Erkki Jokiniemi (2012). Architect's Illustrated Pocket Dictionary. Routledge. p. 262. ^ Edinburgh City Archives. Dean of Guild Court papers, warrant granted to John Adam on 27 June 1764 when he presented a full set of building accounts. Wikisource has the text of the 1911 Encyclopædia Britannica article Jamb. This page was last edited on 2 January 2019, at 21:27 (UTC).